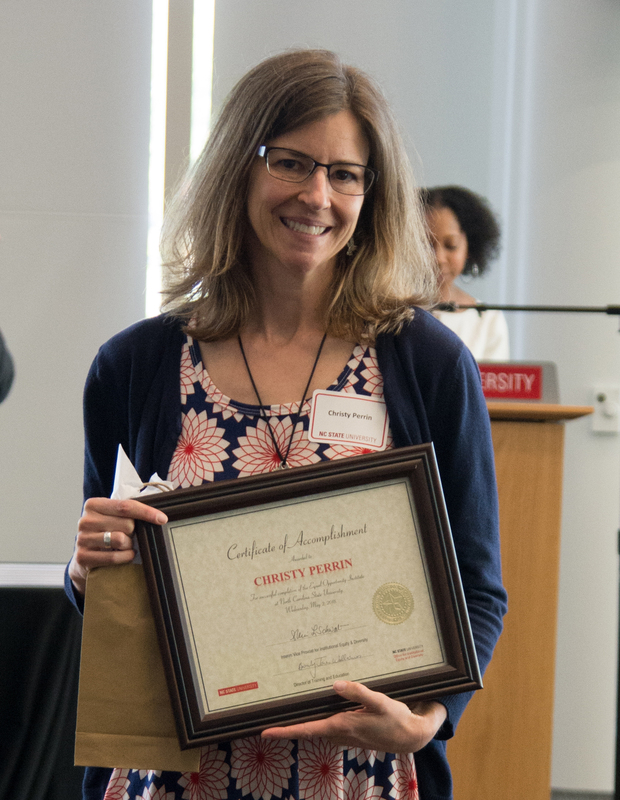 Christy Perrin recently completed a certificate program through the Equal Opportunity Institute at North Carolina State University. Perrin focuses on sustainable waters and communities for North Carolina’s Water Resources Research Institute and the state’s Sea Grant program. Christy Perrin receives her certificate for completing the course. Photo courtesy Equal Opportunity Institute. As a participant in the year-long training, she considered equal opportunity issues in the workplace, and developed skills to excel in diverse working and learning environments. Through WRRI and Sea Grant, Perrin leads initiatives that involve multiple sectors and residents in planning, studying, protecting and restoring water resources in a sustainable manner. Her special interests include helping organizations enhance community development, particularly in historically underserved areas. “I feel encouraged that NC State offers the program and that so many participate. I also appreciate the administration of WRRI and NC Sea Grant providing unwavering support for our team’s efforts to improve equity, diversity and inclusion in our work,” Perrin adds. Perrin has been with WRRI/Sea Grant since 2014. Previously, she worked with N.C. Cooperative Extension as a program manager for the Watershed Education for Communities and Officials group. She holds a master’s of public administration from NC State University as well as a bachelor’s degree in animal science from the University of Vermont. The Equal Opportunity Institute, part of NC State’s Office for Institutional Equity and Diversity, offers this professional-development certificate to the university’s students and employees, as well as the public. For more information, go to oied.ncsu.edu/eoi.